Derived from a pair of concerts at the Berkeley (California) Community Theater on May 30, 1970, JIMI PLAYS BERKELEY is presented here for the first time ever on Blu-ray as a new, digitally restored high definition transfer from the original 16 mm negative. 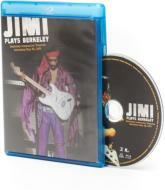 JIMI PLAYS BERKELEY now features nearly 20 minutes of previously unreleased footage including newly discovered performances of such classic songs as Hear My Train a Comin, and Voodoo Child (Slight Return) together with documentary content not seen in the original release. A new Special Feature presentation includes an interview with Abe Jacob, Hendrix's road sound engineer, who recorded the two legendary performances and a 5.1 surround soundtrack of the complete second show performance (mixed by original Jimi Hendrix engineer Eddie Kramer), which includes many songs such as Hey Joe and Stone Free not seen in the film. The brand new artwork includes a detailed essay and many previously unpublished photographs.